Popstar Princess Sarah Geronimo and Bamboo will be working together as coaches in the new reality show “The Voice of the Philippines” in ABS-CBN. Both of the stars did numerous production numbers in many different shows and there are many people who are saying that Sarah and Bamboo have something in common that’s why showbiz people are linking the two stars. “I don’t even know how to answer that thing. But I can say that we have great chemistry on stage. We perform well. That’s a special thing,” explains bamboo, with a smile. The rock-star said he admires Sarah because she is a very talented performer. “She gives such energy to her performances and we sort of just mash it up. In fact, Iris, that last song we did, we have never done it the same. Every single time it’s different. Kapaan lang kami wherever she takes the song, wherever I take the song. We sort of find each other in the end,” recounts Bamboo. He also discloses that there is a possibility for both of them to do a collaboration on their next album if they would be given a chance. 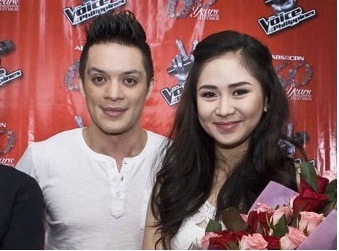 Bamboo is open in making pop-songs with Sarah Geronimo. “I don’t really over think things. I just want to try to be myself. I’m still a badass. I just play from the heart, sing from the heart. Sarah mirrors that. It’s a great pairing on stage,” he added.